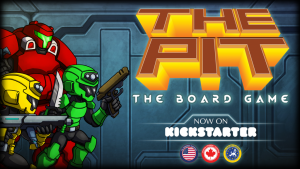 The Pit: The Board Game of The Video Game, The Kickstarter | Kerberos Productions Inc.
We have been working for a year to turn our cult hit PC Roguelike into a four player cooperative tabletop game. As a result we have launched our Kickstarter campaign to get the game made and into the hands of gamers around the globe! Come check out the game and pledge today! We have had a lot of support and very excited reactions to the game, and maybe you can help us make this game a reality!